Are you looking for the new Weber’s Francisco Style Pepperoncini, Olives, and Giardinera products? We are now featuring Golden Greek Pepperoncini, Garlic & Herb Flavored Pepperoncini, Zesty Italian Style Pepperoncini, Onion Flavored Pepperoncini, Hot Sicilian Flavored Stuffed Manz Olives, Greek Giardinera, along with five other varieties of olive products. 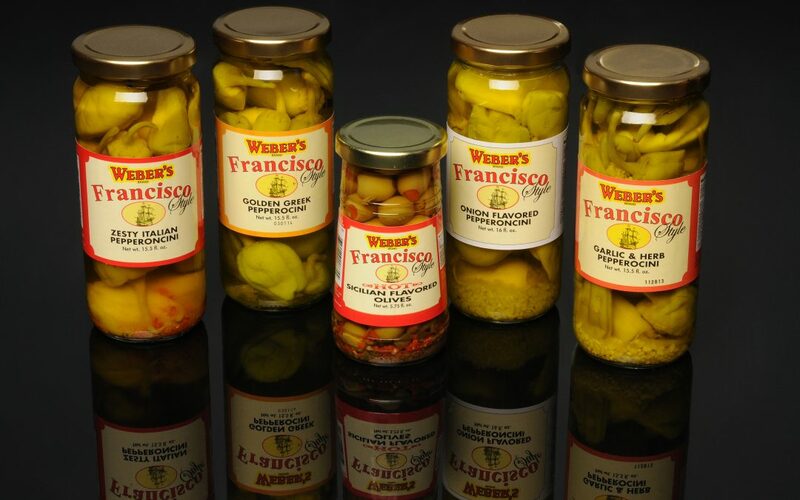 Some of the products are still under the “Francisco” label and some under the new “Weber’s Francisco Style” label. We hope you enjoy these finest quality pepper and giardinera products grown in Greece and Olives grown in Spain. They our finished with Weber’s own unique brines and flavorings for the unique qualities you’ve come accustomed to from Heintz & Weber!!!! !